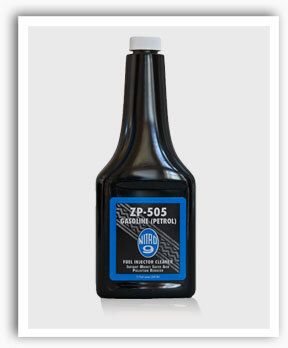 ZP-505 Fuel Injector Cleaner is used for disposing of carbon, varnish and gum on the combustion side of the engine. This covers the injectors, throttle body, cylinder heads, liners, rings and valve stems. How It Works: Apply one 12-ounce (360ml) container to fuel tank after reducing fuel level to 1/4 to 1/3 tank or no more than 5 gallons (20 liters). Operate engine for a minimum of 30 minutes or until fuel tank is almost empty. You may now top the tank with fuel. Remaining cleaner will insure complete burn off of carbon, varnish and gum from fuel system and combustion chamber. It is at this time that ZP-500 Fuel Treatment should be added every 1800 miles (3000 kilometers) to maintain the pristine condition that the cleaner has accomplished. What To Expect: ZP-505 contains Vacclaisocryptene, an intense pressure sub-surface lubricant that penetrates the metal 3-4 mils. It will easily go through gum, varnish and carbon. The engine’s horsepower, idling, emissions, and fuel efficiency will improve after one application.